Well, after a long run of guided trips on Belton, I had a down day today and decided to give things a whirl by myself on Stillhouse. The season is definitely still behind a normal pace as I’ve yet to see much in the way of spawning shad, and the fish aren’t yet plentiful in the lower lake. This 6.75 pound, 24.00 inch largemouth caught today is now pending as the Catch & Release category lake record for this species on Stillhouse Hollow Reservoir. Wind: Winds were pushing 12 to 13 from the SSW pre-dawn and only built from there to sustained 22mph by noon with higher gusts in the afternoon. I had hoped to ferret out some topwater action today, but the surface was too rough for spotting such a thing, and our birds are gone, so, that leaves sonar and experience as the tools of choice. I then headed west and continued the search for bait. At Area 079, at the base of a slope adjacent to the main river channel, I found the bottom carpeted to 3 feet high with gamefish and bait just above them. This action existed over an area about 40 yards in diameter. I immediately lowered the trolling motor, got into a hover over these fish and went to work with the slab (TNT 180) and smoked 14 fish in as many drops. I had some leftover bait on board, so, when I saw a largemouth that I estimated at 5 pounds pursue a juvenile white bass I had hooked, I put a handheld downline out and decided to see what it would produce. My bait immediately got nervous and then got thumped. I resisted the urge to set the hook knowing that it often takes a bit of doing for fish to orient a large bait just right in their mouths. Once I felt the fish move in a definitive direction, I set the hook. I knew the fish was a good one by the way it hardly budged when the hook hit paydirt. After a few bulldog runs and one half-hearted attempt to wallow on the surface, I netted a sweet 6.75 pound largemouth bass measuring exactly 24″. After a few quick photos, I put her back in the water in good shape to fight again. With this good initial experience with bait, I went ahead and anchored instead of fighting the steadily strengthening wind, and put out a total of 3 rods with downlines. I landed 12 more largemouth up to 3.25 pounds, with all of them clearing the 15″ mark — which, of late, has been a pretty rare feat on Stillhouse with the demise of our hydrilla. For the trip, the tally was 13 largemouth bass and 20 white bass, all caught and released. I fished a half-day morning trip with 3 generations from the same family gathered together in Temple to celebrate the 81st birthday of their dad and grand-dad “Pa”. Aboard this morning was “Pa”, his son Joe, and Joe’s two sons, Cory and Tom. The day was forecast to be bright and with light winds, so I knew we’d better get an early start and make “hay while the sun shines” early on. We met at 6:30a — that gave me a few extra minutes before sunrise to get all the gear stowed and do a dockside explanation of some of the techniques I anticipated we’d be using today. Joe got the best of the bunch today with a 5.25 pound blue cat. We were anchored up over a good bunch of fish and bait fishing live bait on downlines … the blue hit the one perch we had out from among 5 other lines all baited with shad. Air Temp: 57F at trip’s start, quickly warming into the high 70’s. Wind: Winds were slack at trip’s start. And only puffed out of the S to SSW at 5-7 for short periods of time through around 11a. After 11a, the speeds picked up to about 8 sustained, but, it was too little, too late as the morning bite was over. Skies: Skies were 100% greyed over. Our first stop this morning came at Area 377. I rigged the boys up with slabs, thinking the bite would start off slowly requiring a little bottom work, and knowing that the slabs could be cast if the fish came up on top. We’ll, we had only landed 2 fish immediately after sunrise when the fish rose to the surface and fed in force for about 20 minutes. I quickly switched everyone over to bladebaits when, on a test cast at some surface feeding whites, I observed the whites chase, but not strike, my slab worked just under the surface. Once we got the blades working, everyone caught fish — a mix of all sizes of white bass and some short hybrids — while this barely subsurface action lasted. We’d tallied 39 fish by the time they slacked off. We continued fancasting and counting the blades down for about 30 minutes more and hooked up steadily. As the fish got lower and slower, we switched over to slabs and worked them off bottom for about 20 minutes more, picking up fish just occasionally. By 9:00a these shallow fish were done. We left this area with 47 fish landed. We then went hunting some deep haunts to shoot for additional whites and perhaps some hybrid. We looked over Area 619 and saw both bait and gamefish on sonar, so I anchored down and we put 6 downlines out with threadfin shad at first. Once things settled, we began pick up fish steadily. We boated a total of 19 fish here in a little less than 2 hours’ time including 1 hybrid, 2 blue catfish, and 16 whites. Around 10:45, after a nice flurry of activity, the wind stopped and it got dead calm. The fish quit as well and never did get going again. We stayed on for another 15 minutes as I continued to see bait and fish, but couldn’t get them to respond. At 11a, we made a run and checked things out in the vicinity of Area 376 and 211. We never had any real strong sonar reading, and only got one hit in our last hour, but landed none. We finished up the day with 66 fish, the largest of which was the big blue cat that Joe caught on a perch — and we had a fun time doing it!! Topics of conversation ranged to everything from broken sunglasses, cold water triathlons, beauty contest losers, TAKS testing, who was leading in the fish count, and more!! I fished a half-day morning trip with returning guest Ryan S. of Temple, this time accompanied by his dad who hails from Austin. Ryan is headed towards his 3rd year of residency at Scott and White so his time off is limited. I was very pleased to be able to put Ryan and his dad on fish in an exceptional way today since we’ve been comparing our calendars since February trying to find a time agreeable for everyone. 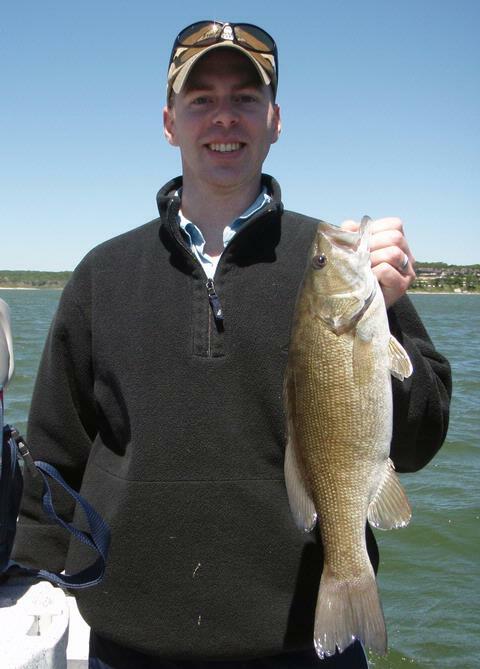 Ryan with a nice 2.75 pound Belton Lake smallmouth bass which leaped about 4 feet out of the water during the fight right at boatside. 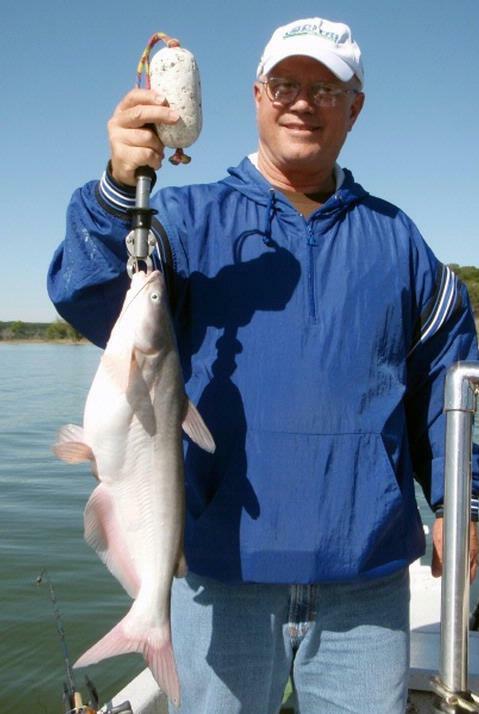 Not to be outdone, Dad got a hard-charging 22.5 inch, 5.00 pound hybrid on downlined gizzard shad. Wind: Winds were due W starting off at ~9, then steadily increasing to a steady ~22mph by noon. This wind cleared out the humid funk and E. wind of the past 2-3 days. Skies: Skies were clearing this morning from an overnight round of rough weather in which severe T’storm and tornado warning were posted for the local area. We got 1/2″ of rain in several brief downpours as various waves of weather came in last night. Fishing was very good today thanks to a clearing W. wind on the heels of 3 days of damp E. wind and turbulent conditions last night — the fish were ready to feed hard. We fished only two areas this morning. First, we hit a stretch of water from Area 380 to Area 617 in 24-30 feet of water. We arrived just as the sun was clearing a low cloud deck in the E. We all let our 3/8 oz. TNT 180’s down to bottom and began jigging. I was into a fish right off the bat and was talking the men through how to adjust their depth and work the slab effectively when we saw a few fish began to pop shad on the surface. At first there was one or two here and there, but before long fish were seemingly everywhere. We switched over to bladebaits (3/8 oz. Cicadas — get ’em at Salado Creek Outfitters) and the boys worked these very effectively and we began sacking up the fish in a big way. We cast to visible fish and immediately began retrieving when possible, otherwise we’d throw to recent boils and countdown to 3 or 4, or blindcast if topwater wasn’t evident and countdown to 10-14. We caught fish non-stop right up until ~11:05. Occasionally we slabbed, but the truly active fish were all suspended, so, when we encountered large congregations of fish on sonar directly beneath the boat, we smoked them for variety’s sake with the slabs and then switched back to the blades when they thinned out. We caught exactly 141 fish before we left this area after the bite died completely. 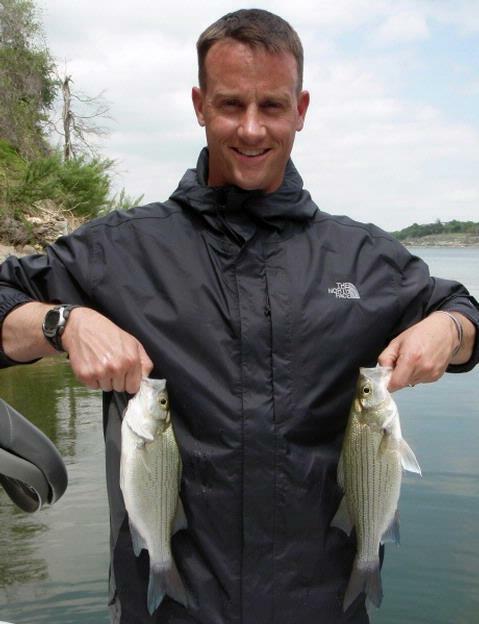 About 1 in every 6 fish was a short hybrid, otherwise all others, save one drum, were white bass ranging from 5 to 14 inches with no real consistency to the size. At one point I put on 3/4 oz. TNT’s to work lift-drop style across the bottom trying to select for larger fish, but we saw no appreciable impact from that bait change. At 11:15a we headed out and checked a number of areas to try to put a little icing on the cake. At ~11:40, we hit Area 618 (as few other areas could be worked with live bait due to the heavy wave action and strong winds). Here, an underwater spine tops out in 24-26 feet. As I motored around, I saw both bait and gamefish, so we anchored and went to work. With live shad fished on downlines, we picked up 4 nice fish in the first hour, then things went quiet. The fish we boated included a 5.00 pound hybrid, a 2.75 pound smallmouth, a nice blue cat, and another barely keeper smallmouth. At ~12:40 another angler moved in much too close with his outboard running, and then proceeded to make 3 failed attempts at anchoring parallel to us less than a cast length away. Whether he realized it or not, dragging an anchor is a surefire way to shutdown a bite, and he succeeded at doing just that. By 1:00p we were headed to the dock having seen both quality and quantity on this rare weather day. I fished a full day educational trip today with returning guest Ben W. of Taylor, TX. My early week enthusiasm over the forecast (S. wind at 9 with 100% cloud cover) took a nosedive when what we actually experience was ESE winds at up to 15 with fog, drizzle and rain. We thus had to work for every fish we caught today. Part of the education experience I try to offer to those specifically requesting such a trip is the real-life repetition of successful habits so the individual can return to his or her home waters and replicate success. For today, we covered live shad fishing for hybrid stripers (easily transferable to catfish, white bass, largemouth, etc. ), we covered working a surface bait by “walking the dog”, we covered jig-worm fishing for largemouth, and we used blade baits and then slabs in conjunction with sonar targeting white bass. Wind: Winds were out of the ESE all day starting off around 9mph, increasing to around 15 by 1pm, then dying back to less then 10 by 5pm. Skies: Skies were leaden grey all day with light rain beginning around 3p, and continuing until after dark. With the revised forecast calling for winds building and gusting by mid-day, I chose to fish for hybrid early on so that heavy wave action later in the day wouldn’t foil our efforts at anchoring or presenting baits naturally. We chose one anchorage well and in a four hour span boated 10 legal hybrid striped bass, 1 short hybrid, 1 white bass, and 1 blue cat, all on live shad. The largest hybrid (which was also the largest fish Ben has ever caught) went 5.5 pounds and was a stocky, thick fish. This took place at Area 98. From 11a to noon, we gave Area 168 a try. We got 2 big bites on 9+ inch long shad, but missed both of them. We then slabbed for a bit near Area 181 and picked up 2 small fish. We then relocated and fished coves 184, 183, 503, 580, and 589 with a jigworm. Ben did really well at this, starting off kind of stiff and mechanical, but quickly getting the hang of maintaining contact with the lure without alerting fish to his presence. He got a hook in at least 3 fish, but never did land one. 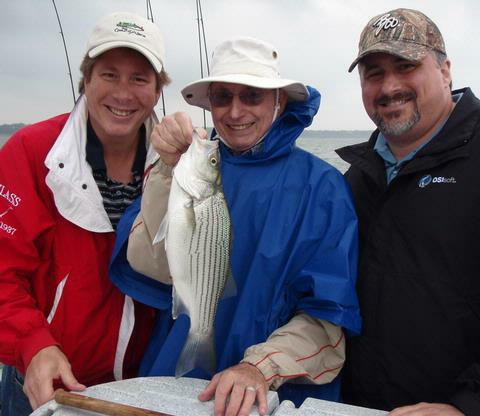 As the skies got darker and the rain heavier, we transitioned to fishing for white bass around 6:15pm. We looked over several areas with sonar, finally stopping at Area 380. We found very reluctant white bass here in 24-25 feet both on bottom and suspended up as high as 9-12 feet. We experienced a bit of success by smoking these suspended fish, but, they were smallish. We headed on to Area 613 and gave bladebaits a try on a shallow flat but had only one hit in about 20 minutes. If the fish were in here, they just weren’t willing to do much. We returned to Area 380 and had some fair action again on suspended fish as well as off bottom on occasional packs of fish passing through this area. In a 15 minute flurry we boated 10 fish and then “pulled teeth” for 5 more right up until it the action shut down completely. For the day we landed a total of 30 fish taking lemons and making a bit of lemonade, but, more importantly, handing the recipe off to someone who appreciated it!! I fished a wonderful “Kids Fish, Too!” trip this morning with Mr. Jesse R. of Azle, Texas, and his three sons, Eli (age 11), Emilio (age 9), and Esteban (age 8). These young men were troopers … they slept outdoors overnight at one of the Corps of Engineer parks on Belton and then woke up to a 54F morning only to head out fishing in the cool weather fueled by oatmeal and beef jerky!! This was definitely a “guys’ weekend”!! The stubborn, damp east winds of the past 4 days finally moved out and a rising barometer and NW winds served to spur the fish on to feed well today. Wind: Winds were out of the NNW at 8-12 . Skies: Skies were leaden grey the entire morning. While waiting for this family to arrive at the boatramp this morning, I fiddled with gear, sharpened hooks, cleaned my sonar screens, etc. all while keeping an eye and ear open for action, just in case. At exactly 6:50a, a small school of white bass mixed with juvenile hybrid began to feed at and near the surface on shad at Area 616. The boys arrived, and, wanting to take advantage of this action while it lasted, I gave them some very quick casting lessons with closed-face reels rigged up with Cicada blade baits. The boys started lobbing casts out where the fish were feeding and, once they got the retrieve speed down just right, they were able to put a few fish in the boat before I even turned the key to crank up the outboard!! Eli caught 2 white bass and Emilio got 1 in this brief flurry. We then ventured out in search of more fish. I scanned over a potential spot with sonar and found some markings on bottom in 20-22 feet of water. I was hoping for hybrid, so we baited up with live shad, only to find that fish I was marking were white bass instead … not a bad problem to have with 3 young men on board all eager to catch some fish!! I switched us over to jigging spoons (TNT180’s in 3/8 oz., as always) and we started to figure these fish out. A straighforward jigging approached did the trick for most fish, although a smoking tactic also put some bonus fish in the boat when I saw suspended schools form and could direct the boys to tempt them. We stayed on top of this concentration of fish for 3 hours straight in 17-21 feet of water from Area 614 to Area 615. Over that period of time we caught an additional 62 fish, including one largemouth bass, 2 channel catfish, 11 short hybrid stripers, and 48 white bass. I was very impressed with all 3 boys. They all stayed very focused on thier technique and were very consistent on controlling the depth of their presentation as well as the action they imparted to it. They responded well as I offered suggestions and corrected their form, and their willingness to be taught paid off for them. I fished a half-day morning trip with returning guests Jim and Shena S. of Austin today. On two previous trips Jim and Shena enjoyed some mixed bag angling, with much of our catch consisting of white bass taken on blade baits, live shad, and jigging spoons. Although they enjoyed this fishing tremendously, it wasn’t a kind of angling they could take back to their “home lake” and replicate. So, their request of me today was to familiarize them with some classic largemouth bass fishing techniques designed for bass hiding in cover that would equip them to do well upon their return home. 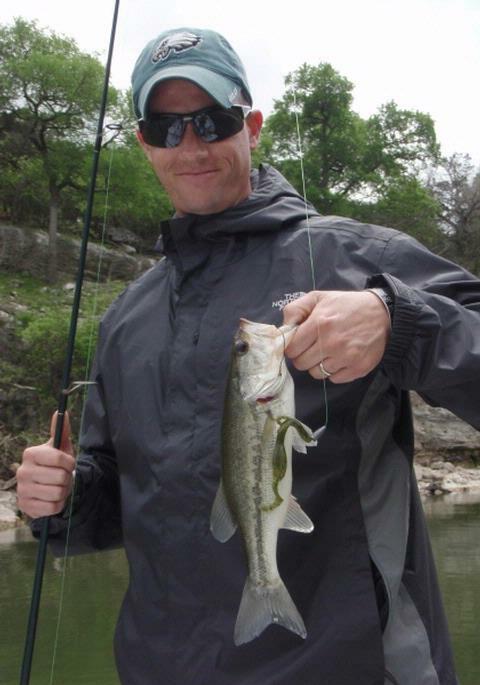 …and Jim got an “eleveth hour” largemouth off a rocky outcropping just shortly before noon. Wind: Winds were from the E at ~10-12 the entire trip . Skies: Skies were leaden grey the entire trip with rain falling pre-dawn, and occasional sprinkles thereafter. As we got underway, we began up in shallow cover where brush, trees, lay-down logs, etc. were the cover type I expected to find bass in. It soon became apparent that the accuracy required to land baits consistently in the nooks and crannies the bass hide in was going to be beyond Jim and Shena’s ability level at this point. I suggested to them, as I do many beginning anglers looking to truly improve there abilities, to begin practice casting at home, then take those polished skills onto the water. A few pointers for doing this and making the most of it include: 1) practicing with the same gear you intend to use on the water, 2) using the same lure or lures you’re likely to use on the water (so the weight, wind resistance, etc. is all familiar to you), 3) an inverted garbage can lid makes an ideal target, and 4) vary your distance and your position relative to the wind (i.e. cast upwind, downwind, cross-wind, etc.). This made sense to them, and we regrouped a bit and moved on to work some areas where accuracy wasn’t as critical. We hit a number of areas, moving on if no action was immediately forthcoming, or lingering a while if action came quickly. We used jig-worms at Areas 420, 421, 422, 386, 423 to 246, 399 and 777 and by the end of the day had managed 6 largemouth bass. Of course in my mind I’m always looking for correlations or common denominators as to what is producing. The areas that gave up fish today all had solid limestone as a bottom substrate, were in fairly clear water, and we found the fish in 7-8 feet with nearby access to deeper water (Areas 420, 421 (2 fish), 422, 423, and 246). This 6 fish day was a much lower catch rate than over our past two trips, but I let Jim and Shena know ahead of time to expect just that. Working soft plastics can be a bit tedious and requires full, constant concentration. As Jim said at the outset, “I’m not paying to catch fish, I’m paying for a fishing seminar.” And I tried to provide just that. By day’s end we’d practiced spinnerbaiting, Texas rigging, and jig-worming and discussed a host of other tactics beyond that. After coming off the water, Jim pulled out a stack of 3×5 cards from his jacket, each had a neatly written question about tactics, terms, conditions, etc. that he had questions about. We peeled off our rain gear, leaned against the boat in the parking lot, and went card by card until all of his questions we hadn’t already addressed on the water were answered. 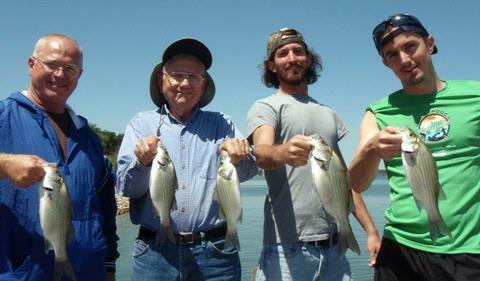 I fished a “father and sons” trip today with David and Cory C. and their dad, Vernon C. David is from the DFW area and Cory traveled in from the Houston area just for this trip with Vernon, who has retired to the Temple area. This was all done as part of a Christmas present to him from “the boys”. 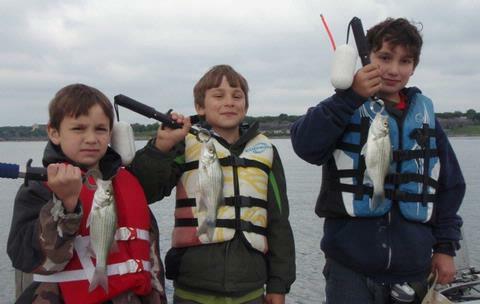 For all 3 men, most of their fishing experience up to this point came as boys through Boy Scouts and involved bank fishing for smaller fish with basic tackle. I hoped to “up the ante” with some quality fish for their time spent on the water today. Fishing was a bit tough today as you might expect with a damp east wind, but, the cloud cover and clear and warming water trumped that to some extent and we put together a decent take by day’s end. Vernon took big fish honors today with this 23 inch, 5 1/8 pound hybrid. Dave (L), “Pop” Vernon, and Cory (R) with one of 13 hybrid we boated today on live threadfin shad. Winds: Winds were E at 10-12mph. Skies: Skies were grey to the point of occasional mist all morning. Long story short, I knew fishing would be a bit tough today given the E. wind, so I planned on using live shad now that the threadfin shad spawn is taking place. We saw no topwater action, no helpful bird activity, and even sonar readings on areas where we did find fish were sparse at best. We found fish in two locations today. First, around 8:00am, after spotting fish on sonar and failing to get them to respond to a downrigging approach, we put tightlines down and drifted along the 20 foot contour between the shore and Area 347 and were rewarded right away. We boated 2 largemouth and a crappie here and missed several more fish as the fellows got used to the hookset from out of the rodholders. After this area quieted down we did some more looking and found fish at Area 294. Another boat was in this vicinity and was doing very well, so I asked if it was okay with them to fish nearby. All was well, so, we anchored down and baited up and did put a hybrid and a small bluecat in the boat with 2 other fish missed, but we just weren’t right where I’d preferred to have fished on this area and I certainly didn’t want to crowd the other gentleman, so, we departed to search out other action but found nothing. We returned to Area 294 at around 11:30am and found no other boats fishing, so I anchored us over top of bottom-hugging fish showing on sonar and we began to catch fish located just SW of Area 150. The action was slow but consistent, and, in about 2 hours time here we boated another 12 hybrid as well as 2 more blue cat and 2 white bass, with quite a few missed strikes. Our hit to catch ratio was a bit low today — 21 fish caught on 57 shad used — that’s about 37%. We did chum with our dead bait and I know that brought in some small blue cat, but we had a good number of solid hits that brought the rod tips right into the water and then they just sprung free. Need to experiment with hooks and leader lengths a bit more I suppose. One funny episode took place as we were nearing the end of the trip. We had just a few shad left in the shad tank, and the water spitting out of the aerator was making it tough to see the remaining fish. I asked Cory to “pull that black rubber plug” — meaning to separate the electrical lead on the 12 volt power source that powers the aerator. Well, Cory did exactly what I asked him to, only the black rubber plug he pulled was the drain plug to the shad tank!! We all looked at each other in a bit of disbelief when we heard a strange sloshing sound on Cory’s side of the boat and then had a good laugh when we all realized the miscommunication that had taken place. All in all a fair trip with some good fellows. 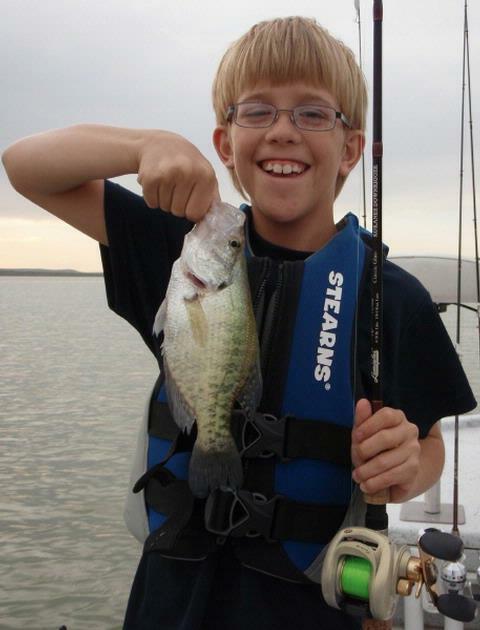 I fished an evening “Kids Fish, Too!” trip with 16 year old Eric M. of Belton this evening. This trip was a birthday gift from his grandmother. Eric worked a Rip Shad at sunset for this white bass. This largemouth was one of five species we caught today as the water continues on a nice warming trend into the high 60’s. Winds: Winds were waning as we drew closer to sunset. We began the trip at SE13 and finished up at SE6. Skies: Skies were mostly sunny. We started our day off of Area 555 with a flatline troll of twin Rip Shads working over 9-14 feet. 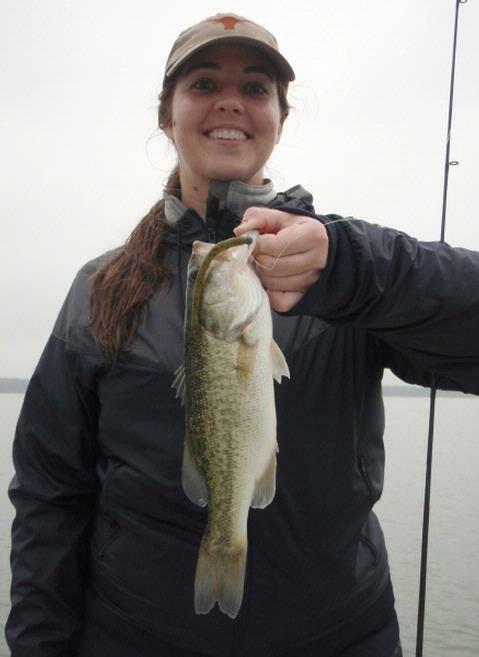 We caught fish consistently here including a mixed bag of largemouth, crappie, and white bass. The white bass were smallish, and Eric came to learn, so, we left those fish in hopes of expanding Eric’s horizons and finding some better quality. We flatlined off of Area 888 as a test and came up with only 1 crappie and 1 white, and neither showed on sonar to be associated with a school of fish so we moved on. 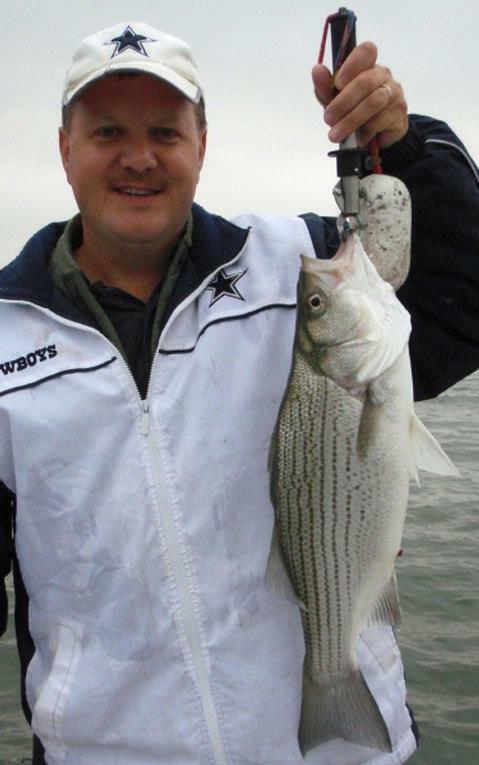 We hit Area 100 and picked up one suspended white bass on a smoked slab with no other fish or bait really showing. We hit Area 595 and picked up a single drum with no whites showing on sonar. We hit Areas 604 (zeroed), Area 599 (2 crappie), and Areas 145 and 149 (zeroed at both). All of this was via slabbing on sonar. With about an hour or so of light left, we headed to Area 116 which has been such a consistent area this Spring. About 20 minutes either side of sunset produced the best action. Here again we were flatline trolling as these loosely schooled fish were suspended down at 6-11 feet. Just after sunset I saw sufficient numbers of fish holding on bottom to allow us a casting approach with bladebaits, but, given the choice, Eric wanted to stick with what was working instead of getting too exotic. He probably made the best decision — we landed several more healthy whites until they shut down altogether right at dark. By now we’d boated a total of 28 fish. For his time spent on the water Eric got to see 3 different tactics used for fishing both suspended and bottom-oritented fish, he learned to tie an improved clinch knot, he used GPS to follow a “snail trail” and successfully backtrack over a productive trolling path, he got an introduction to sonar interpretation, and landed fish of 5 different species (crappie, white bass, largemouth bass, drum, and redear sunfish). 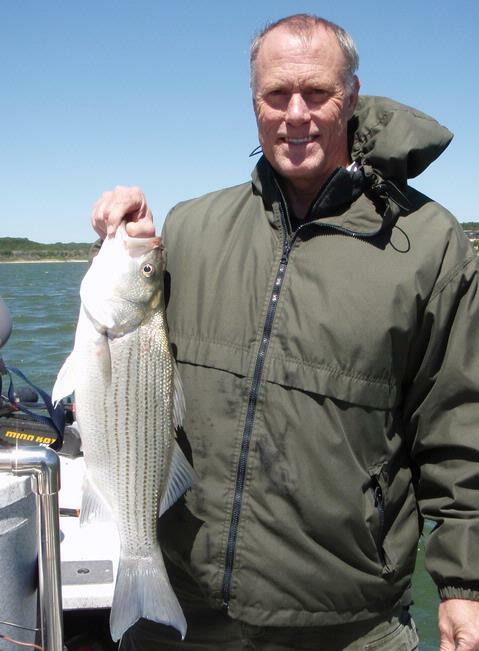 I fished a half-day morning trip today with First Sergeant Steve M. of Copperas Cove. Steve is a married father of two, and is an Iraqi War vet with the 1st Cavalry Division (Thanks for serving!!) Steve just purchased a new bass boat and is new to both boating and Texas fishing, so he wanted a general introduction to both during our time on the water. 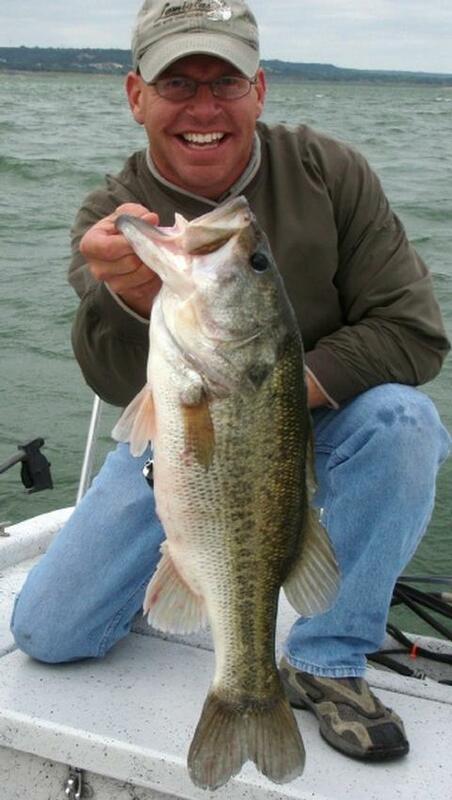 Steve with a shallow water black that nailed a Zoom Brush Hog. 2 of the 68 white bass we worked over with blade baits today. Wind: Winds were already pushing from the S at 7 at (obscured) sunrise, and increased slowly up to 18mph from the S. by 10am, and then leveled off. Skies: Skies were heavy and grey until 11:30, then slowly cleared to partly cloudy. We started our day off in 18-21 feet of water looking at Area 165 with sonar after failing to see any bird activity of note. Fish and bait were both present here, so we began our day vertical jigging over these fish. Steve got the hang of the technique, but, the fish were really sluggish. I landed 3, and they all required a bit of finesse, and they were smallish, so, after spending about 20 minutes over these fish and only getting follows but no strikes on Steve’s rod, we moved on. As we ran from place to place I was constantly pointing out sonar interpretation tips and boat handling considerations to Steve. I turned the trolling motor over to him at one point so he could get a feel for fishing with his hands while maneuvering with his feet into a ~15 mph wind. We next connected with fish at Area 613. We worked blades baits in 5 to 13 feet of water on this fairly flat terrain and found white bass of all sizes holding very tight to the bottom here. The largest went no more than 12.25 inches. Surprisingly, we only hooked one hybrid, a short fish, but lost it at the boat. I was using a white/blue Cicada and struggled a bit while Steve did well on all white. I then changed over to chartreuse and did just fine. Eventually, the fish lost interest in white as the skies brightened and the wind stirred up the silt in here pretty badly. We finished up both using chartreuse. The 3/8 oz. version did the trick for us fished lift-drop style with a fairly slow retrieve. We stayed on these fish for nearly 3 hours, and boated a total of 65 fish here, with numerous other fish hooked and lost. Our tally now stood at 68 fish and the white bass action was clearly over. We wrapped up our day by changing gears and giving Steve an intro to classic Texas Rig lizard fishing. We hit a protected cove between Areas 585 and 586 and found some buck bass up in the shallows. 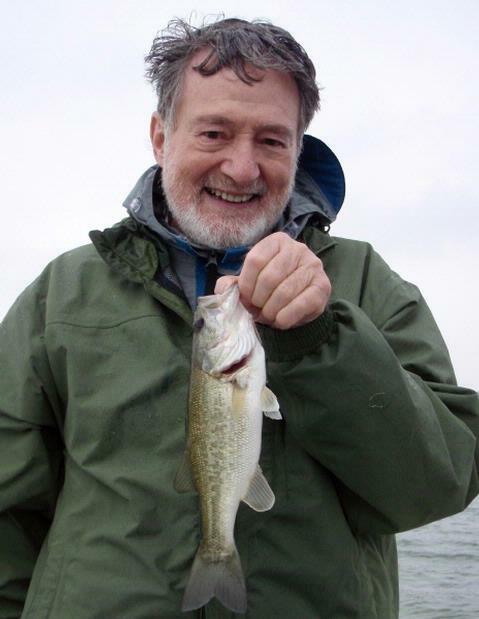 A Zoom Brush Hog did the trick for 2 small fish, but, small or not, the fundamentals were learned: anticipating ambush points, casting, controlling slack, maintaining contact with the lure and with bottom, line watching, ensuring line control to allow for a hookset, hooksetting, playing, and landing. We wrapped up a bit before 2p. I very much enjoy “teaching” trips like this one. They’re especially enjoyable when you have an eager, teachable person like Steve on board. 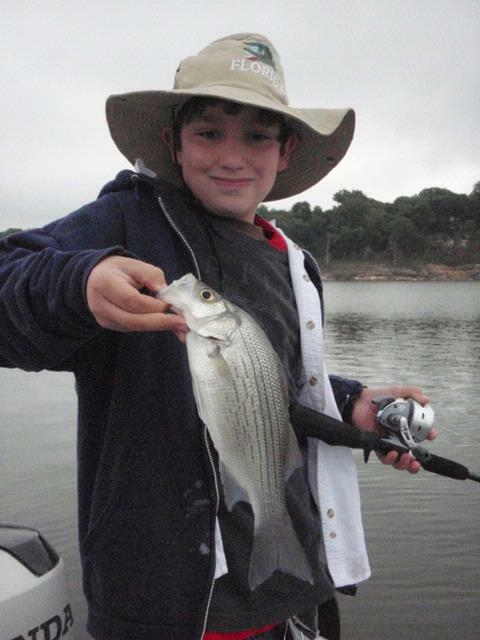 I fished a full day on Belton today, scouting in the morning, and fishing a “Kids Fish, Too!” trip with a young man who just turned 10 from Gatesville in the evening. I met Dalton’s dad, David, at the recent Bell Co. Expo Center Boat Show in January. He and his wife got their son a fishing gift certificate for his birthday, and, after comparing notes for a few weeks to make sure the weather and the fishing was going to work for 2 ten year olds, I finally got Dalton and his buddy, Gage, on the water. Wind: Winds were light from the WNW following the passage of a front last night, then slowly turned around from the S. with some haze building to the point of obscuring the sunset by day’s end. Skies: Skies were clear all morning, then began to get overcast with the arrival of winds from the S. after noon. I started off fishing a slow troll with flatlines at Area 409 and picked up a single white bass right off the bat, but found no consistency here and moved on up the shore to the north without getting a single strike. After glassing for a few seconds, I spotted some bird activity in the area triangulated by Areas 609, 610, and 611. 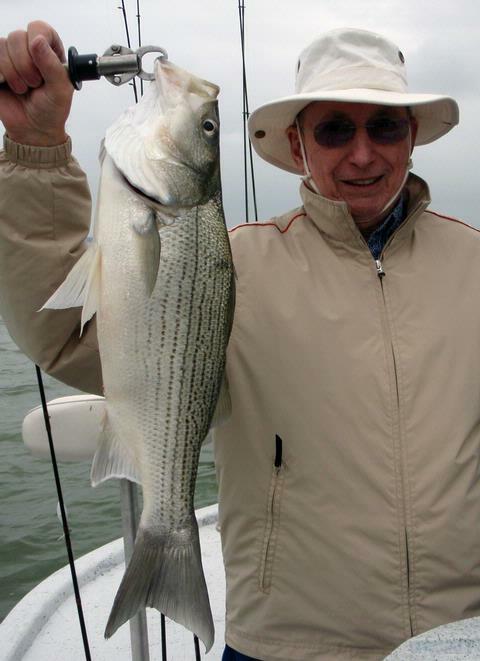 White bass and hybrid stripers were herding shad to the surface and feeding heavily. Threadfin shad upwards of 5 inches were regularly leaping out of the water to get away from the gamefish below. As the fish were breaking on the surface, I threw a Spook Jr. and hooked up every time (once even catching 2 fish on the lure at the same time). After they disappeared from the surface, I’d count down a blade to the depth I saw them on sonar and then steadily retrieved for very consistent action. Once the large schools of fish moved on, I set out a flatline troll with Rip Shads until some more surface action provided clues to fish location, and the whole cycle started again. Over 3 hours I put 62 fish in the boat including 2 keeper hybrid and by far the single best bag of whites I’ve ever caught on Belton, with most fish going 13 inches, and 2 exceeding 15 inches (just fractions of an inch shy of the lake record). As the W wind turned S, the action began to die, and by 11:30, all was done. I moved on down to Area 608 and 612 for the evening trip. I picked up Dalton, David, and Gage around 3:30p, and we really struggled until 5:30p. From 5:30p to sunset, we experienced slowly improving action picking white bass out of the top 6-11 feet of the water column by flatline trolling for them. For a very brief spell around 7:15p, a small push of white bass came up shallow and forced some shad against the bank. The boys cast fast and furious and immediately began reeling their bladebaits back in to target these fish just inches under the water’s surface. After that flurry died, we resumed trolling until all went quiet around 7:50. 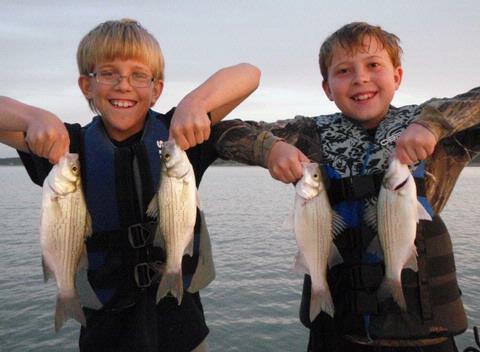 By this time the boys had put a total of 26 fish in the boat including 24 white bass and 2 crappie.